The sequel to Rapnzel's Revenge was definitely worthwhile. This time we see Jack's back story. How and why he ended up in the Old West with a goose. 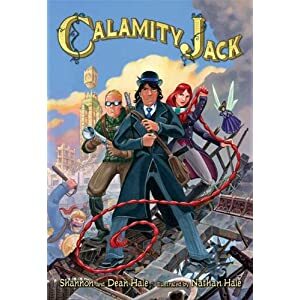 I liked Jack, but his story wasn't the best. All stupidity and running. But then once he met Rapunzel, he became a much more interesting character. I liked the book once we caught up with where Rapunzel's Revenge left off. Then it started to progress like I thought it should. I liked the inclusion of other fairy tale style monsters and creatures. It was a nice touch. It started to make a lot more sense. If Rapunzel and witches and golden laying geese are in this world, why shouldn't other creatures? Made sense. The dialogue was fun. The visuals fun. Everything about it was fun. Definite fun 20 minute read.